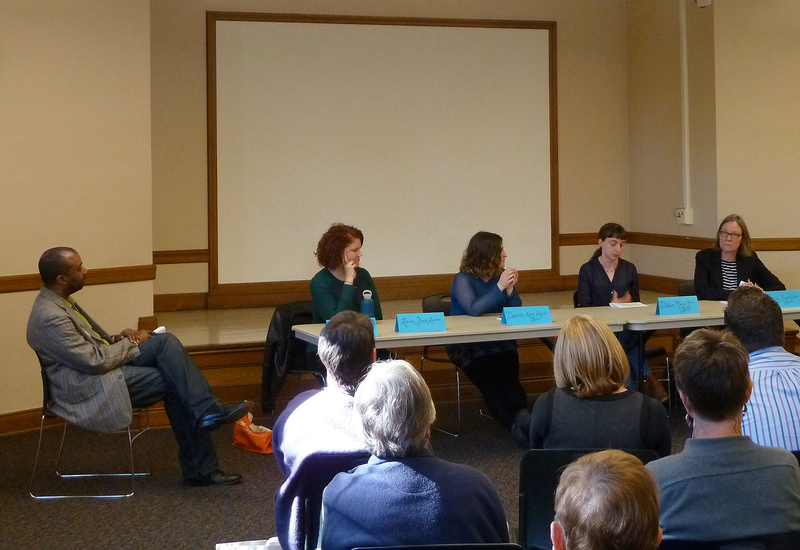 Last weekend, I went to the Friends of the Seattle Public Library’s annual meeting, which featured a panel discussion on “The Future of the Book” with four Seattle independent bookstore owners: Lara Hamilton of Book Larder, Danielle Hulton of Ada’s Technical Books, Debbie Sarow of Mercer Street Books, and Christy Dawn of Secret Garden Books. Are they feeling threatened in an era of Amazon and e-books? Their answers (paraphrased by me) might surprise you. Seattle City Librarian Marcellus Turner listens to Lara Hamilton, Danielle Hulton, Debbie Sarow, and Christy Dawn talk books. As the owner of a specialty cookbook store, Lara says that she doesn’t feel as much competition from e-books as you might expect. Many of Book Larder’s customers are young or novice cooks who have had disappointing results with free online recipes, and prefer the authority of a trusted source. Lara also considers the library an “interest generator” rather than a competitor: she says people will check out a cookbook, try a few recipes that pique their interest, and then come to her store to buy their own copy. Book Larder has frequent author readings and cooking classes, and one of the best perks of attending a reading is that you usually get free samples prepared by the author! Lara says her customers understand that the bookstore needs their support, and that voting with their dollars is the best way to attract book tours and events. 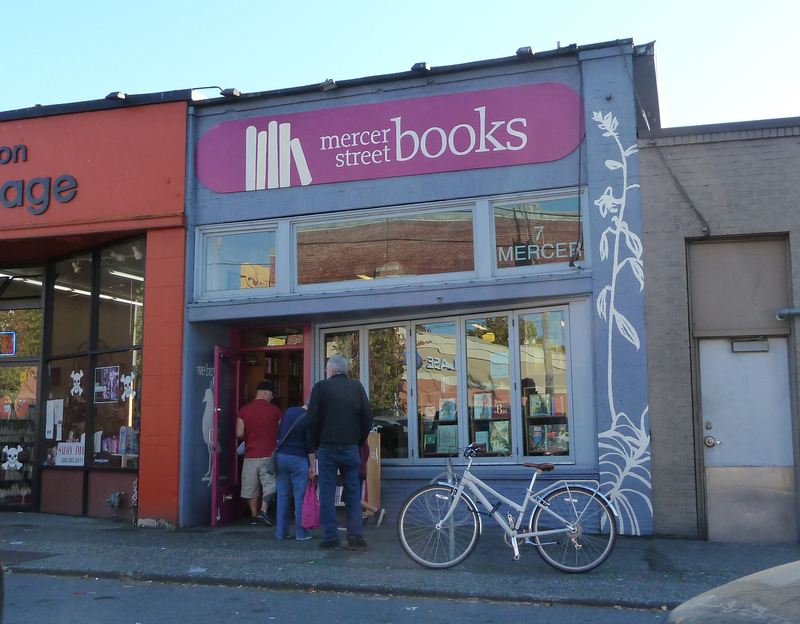 Ada’s Technical Books has been around for several years in Seattle’s Capitol Hill neighborhood, and in fact, it’s doing so well that they’re moving to a larger location this month, with a bigger event space for author readings. Danielle sees her customers as not only tech-industry professionals, but regular readers who simply have an interest in science and tech subjects. For that reason, she encourages a “clubhouse” atmosphere in the store, where visitors can hang out and enjoy conversations. Like Lara, Danielle reports that customers tend to buy novels as e-books, but prefer to buy manuals and technical books in print. However, they partner with Kobo to sell e-books to give e-reading customers a way to support the store. 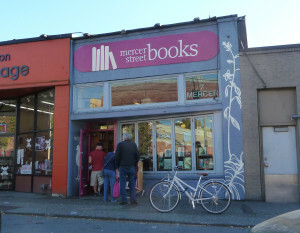 Mercer Street Books is a used bookstore, so naturally they don’t carry much in the way of e-books —which is fine, because the used-bookstore customer tends to prefer print anyway. Debbie says that her customers are often tracking down a particular edition or out-of-print title, and so the print version is actually very important to them. And, as she points out, used books are still cheaper than a new e-book. Christy is in a somewhat different situation than the other panelists, in that she purchased Secret Garden Books from a previous owner rather than starting the store from scratch. Her bookstore has several decades of history in Seattle, and she says the key to success is being firmly planted in the community through events and outreach. Secret Garden partners with local schools to do book fairs, just like the Scholastic book fairs you may remember from your childhood. She also believes that being located close to a library branch is helpful for business. While Secret Garden specializes in children’s books, she says it has become increasingly important to branch out into non-book gift items (such as calendars, stationery, and novelty items) to make sales. She feels heavy competition from Amazon, and doesn’t like that Amazon’s Kindle is the only major e-reader that doesn’t support Kobo e-books, making it difficult for customers who would like to support indie bookstores with e-book purchases. Dark secret: Christy admitted that she’s not a huge fan of YA dystopians, and rarely finishes them.